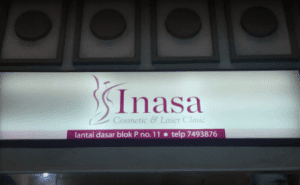 Inasa Skin Care Clinic is present in order to reach out and answer all the wishes and interests of the skin for women and men. Create and present a pretty healthy skin glow. Inasa Skin Care Clinic Laser equipment powered by the latest generation of the most advanced imported from Germany and Italy is capable of providing maximum service also can handle all customer complaints or patient. Inasa Skin Care Clinic uses beauty products have passed the test BPOM. So no need to worry and doubt the security aspects of cosmetic use because we are concerned about security for the skin .. So we give a satisfactory result.